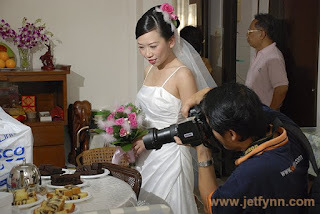 When Rachel and Leendert called from Netherlands to book us from Ipoh to cover their actual day wedding photography in Penang, we went there with a team of 3 starting to drive from Ipoh very early in the morning. Cassandra, Anne and I had a nice breakfast and off we went. Rachel was halfway doing her make-up when we arrived so we started shooting whatever we see. 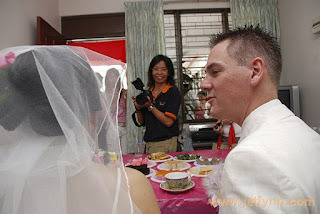 Here's some of the pictures of us working that day. At Gurney drive outdoor. They are very cooperative and we got the required shots within 25 minutes! Cassandra as the second photographer enjoying herself as well!